When the Bethesda Hospitals’ Emergency Preparedness Partnership (BHEPP) began searching in 2008 for an emergency backup communication system to support its three allied hospitals in emergencies, they turned to one of the oldest electronic communication technologies in the world—radio, pioneered by Guglielmo Marconi in 1896. Since then, the technology of amateur or “ham” radio has evolved along with commercial radio, and today benefits from 21st century digital communication technology, including the Winlink 2000 (WL2K) system. WL2K automatically creates an interface between digital radio messages and Internet email, a technology embraced and improved upon by the National Library of Medicine for emergency communications. For the BHEPP, a mutual-aid collaborative of the NLM, the National Institutes of Health (NIH) Clinical Center, Walter Reed National Military Medical Center, and Suburban Hospital Johns Hopkins Medicine, a not-for-profit community hospital in Bethesda, Md., communication is key to maintaining services during emergencies, when storms, earthquakes, terrorists, hackers and other causes may threaten the Internet, cell phones and landlines, and there is a simultaneous surge in those seeking medical attention. Communication must not fail, not only for patient care but also for coordinating responses and allocating resources. During major disasters, studies estimate that as much as 30 percent of a hospital staff may be unavailable or out of touch, either incapacitated by the disaster event itself or unable to contact or make their way to the hospital. 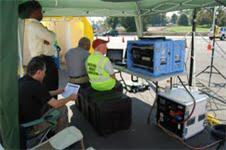 Members of the BMERS team operate a portable unit during a disaster exercise and exhibit at Walter Reed National Military Medical Center in October 2012. From left to right, seated in the foreground, Dr. Andrew Mitz (NIMH and NIHRAC), Oluwaseun Ayoola (contractor, Aquilent, Inc.), Carl Cornwell (contractor, Aquilent, Inc.) and Anthony Krauth (MARS). Photo by Victor Cid (NLM/SIS/DIMRC). Given this, the BHEPP planners wondered whether ham radio could transmit critical data beyond an Internet and phone communications blackout zone created by a disaster. For the answer, NLM communication experts turned to the Military Auxiliary Radio System (MARS), a United States Department of Defense volunteer network of licensed amateur radio operators who assist the military with local, national, and international communications. They do so through automated radio stations that act as long-distance wireless access points, similar to the “public” Wi-Fi hotspots and access points available at libraries, coffee shops and other locations. To enable the BHEPP’s WL2K backup communication network, NLM’s Disaster Information Management Research Center (DIMRC), part of Specialized Information Services (SIS), called upon Victor Cid, senior computer scientist. He and his team adapted the MARS WL2K system to form the backbone of the BHEPP MARS/Winlink2000 Emergency Radio Email System (BMERS). BMERS can also use the ham radio version of WL2K instead of MARS’ as a backup. BMERS allows multiple hospital personnel to send and receive Internet email via any Ethernet or Wi-Fi capable computing device, such as a laptop, tablet, or smartphone, and does not require installation of any additional software on the devices. The NLM technology also allows the alliance hospitals to transmit simultaneously over a single radio, something that was beyond the initial capability of WL2K. In addition, Cid and his team simplified the user interface to shield the radio operator from distractions during a crisis, and developed a “smart power system” to better manage the radio’s power requirements during disasters. The system continues to be enhanced, but is now ready for use by the member hospitals, should a disaster occur. A base radio station is always available on the hospitals’ private computer network and can be activated on short notice, and, if additional communications support is needed, a portable radio station can be deployed by volunteer hams and NLM staff. As with all communication systems, amateur radio has its drawbacks. It is slow, depends on electricity, as most communication systems do, and requires the expertise of the radio operators. But other possible emergency systems have challenges, too. For example, satellite phone transmissions are costly, and satellite service can be unreliable during disasters sometimes affected by weather. Amateur radio, by contrast, is inexpensive, always available, and the ultimate in survivable, decentralized, infrastructure-independent communications. Since joining the BHEPP in 2008, the NLM, the world’s largest medical library and a leading medical-informatics research facility, has taken the lead in several projects that are transforming the way hospitals manage and react during emergencies. Among them are the People Locator™ and the Patient Tracking and Locating System. January 10, 2013 in Products.